Free fantasy RPG with a dynamic magic system set in a world where women control sorcery. Once again Greg Christopher has created an amazing rpg product, a work of professional quality, and released it as free download. As with his previous creations, including Cascade Failure and Errant, he's crafted a deceptively simple game, presented in a format that has design goals of its own. 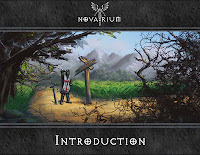 Novarium is a fantasy rpg with a system backbone that feels close to the "Old School Renaissance" or OSR work of the last few years. But that's a superficial analogy and the author takes some of those simple mechanics in a new direction. Beyond that Novarium brings a sharp and distinct premise to the fantasy table. Magic exists, but can only we done by women, the Novaria of the game's title. That gender-based magic echoes themes from fantasy literature (such as Jo Clayton's Duel of Sorcery, Dave Duncan's The King's Blades and even Robert Jordan's Wheel of Time). As well, Novarium is a kind of re-imagining of Ars Magica, done with an OSR spin. Players have multiple characters, including a mage, effectively a troupe. The magic system itself is flexible and improvised, based on combining two factors to create a spell. Novarium can be obtained from RPGNow or the author's site. The zip file includes several elements, all in pdf format. 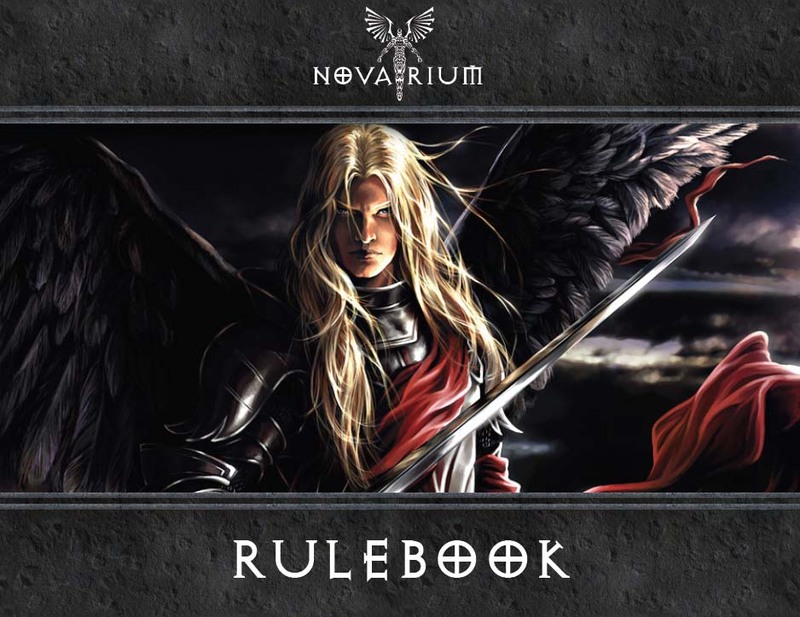 Novarium's core content comes in the form of an introduction document (11 pages) and the rulebook (99 pages). There's also a nice separate file with the two-page character sheet, clean and with plenty of space. I often look at the cs first to get a sense of a game. Excessive details, bad layout, or overly dense design turns me off. Christopher juggles the need to have a number of factors at the ready with user-accessible design. He manages a neat trick of providing a sheet laying out the information for magic users, but which can easily be used by other character types. The set includes a number of sample materials as well, three different maps, working down in levels. First a world map, then a continent map from that world, then finally that continent broken down into sample regions. These full-color, unlabeled maps offer an excellent resource for gamers lacking map-making skills or software who still want to put their own spin and names on the game world. At the lowest level, there's also a truly lovely sample "Mark" map. Marks are the sets of properties granted to the players at the beginning of the campaign (more on this below). Greg Christopher has an eye for good, clean design. This particular product combines that with some new experiments- working to make the game more accessible to new players. The introduction chapter tries a more graphic and iconic approach to explaining the game. To complement that, Novarium once again marshals an amazing stable of artwork, donated by artists. Each image has a hyperlink back to the artist's website and there's a complete list of sites at the front of the rulebook. Modern rpgs have moved towards more consistent art - with a single artist, one artist per chapter or at the very least a small talent pool. There's something to be said for that approach. Novarium comes from another direction, by necessity, with art of very different tone and style from page to page. It works, evoking an 'anything can be imagined' feeling that reminds you of classic rpgs. That art is pretty great- and amazing for a free product. 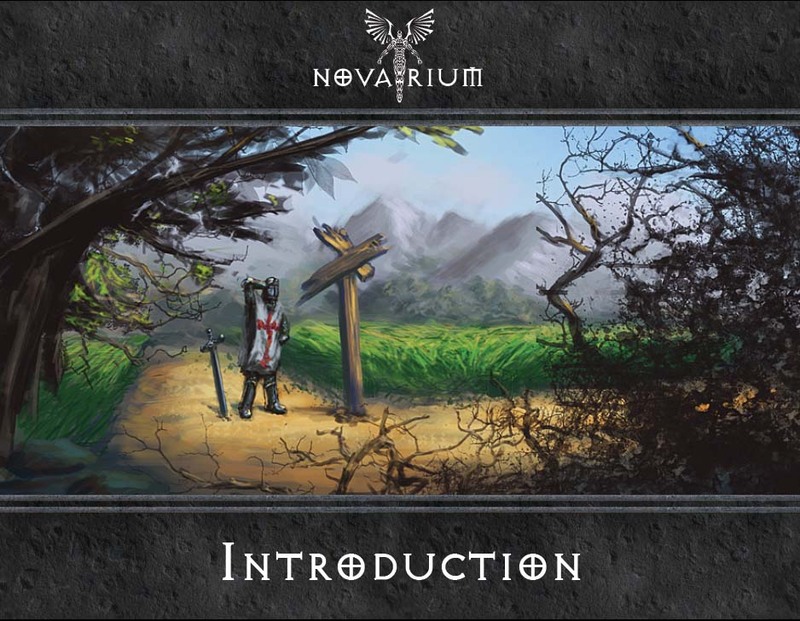 Novarium begins with a separate 11 page pdf, introducing both the core concept of the game and the idea of role-playing in general. I'll admit that I usually skip the "What is a RPG?" section- but Christopher here tries a new approach, one that made me slow down and consider how we actually show new players what an rpg is. Barring a mentor or a group, how do people actually pick up and learn a game? The last few years have seen more products aimed at a younger audience (Argyle & Crew, The Princes' Kingdom ) or as introductions (Pathfinder Roleplaying Game: Beginner Box). I had the luxury of being taught by older players when I first started. Novarium's approach combines simple icons with quick text to show players what to expect. It includes a example of what a session looks like, leading into a teaser that hopefully pulls the player into the main book. At the same time, Novarium sets up what makes it different from most other fantasy rpgs. It puts magic into the hands of a narrow group: women only, a radical shifts from the usual D&D set up. The game explicitly comments on those gender roles, with power and chauvinism moving in the opposite direction. Power creates a hierarchy for the setting. Each player in the game will play a Novaria, but they will also have secondary characters to play. The introduction sets out several other cornerstone concepts loosely- the idea of attachments, which join a diverse group together is suggested but not explained. Novarium begins with a fairly definite campaign frame: the players take possession of a Mark, delineated by magic and possessing sources of power. It also suggests that arcs in the game will take place over seasons. That scale allows for growth of the mark, as well as adventures within that time. If you've played other games with seasons, such as Blood & Honor or Ars Magica, such ideas should make sense. 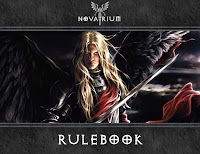 The main Novarium rules take up 99 pages, with a hyperlinked table of contents jumping readers to the eight chapters. One important detail is that the introduction is a vital first read. I began with the main rules, and was a little puzzled that the core concept of the game setting wasn't presented right away. That illustrates that a stupid user can always undercut a smart design. Chapter One, Basics, lays out a little more fully the "What is an RPG?" begun in the introduction. It then goes on to lay out the basic kinds of tasks and rolls. Novarium primarily uses d6 and d10's, with the other dice types only used for the damage resistance of armor and a couple of minor randomizations. The GM, here called the Architect, controls the narrative and set up. The system itself is fairly simple. For standard actions, players roll a number of d10s depending on the difficulty. The tougher the action, the more dice rolled. The final result is compared against a relevant attribute. Rolling under the attribute means success. Special traits and other effects can modify the value of the attribute tested. The system does mean that the GM will have to set the difficulty for any action (as opposed to players having a standard reaction to "make a roll for me..." invocation). Saves constitute a special kind of test where players may not benefit from certain bonuses. Opposed actions are conducted via standard rolls with the margin of success being the tie breaker. Characters involved in such a contest may roll different numbers of dice, depending on the situation. Chapter Two presents the fairly simple process of making up a character. This twenty-six page section walks the reader through step by step. Novarium uses random stat generation, with 3d6 being the default (though two other options are provided). Six attributes define characters: Agility, Fitness, Knowledge, Magnetism, Perception and Willpower. That's an interesting shift of roles from the classic six and their foci. Still those difference won't be too hard to pick up. After this players pick an Identity, effectively their class or profession. I should note here that Novarium does change a number of expected rpg terms. That works when the change points to an important distinction or shift in role, such as Architect instead of GM or DM. For the most part that works across these rules, but I will admit to replacing the terms in my head as I read them. Novarium offers seven Identities, three of which cover the demi-human races of the setting. Female humans can be Novaria (magic users) or Tavaria (knights errant serving a Novaria). Male humans are second-class citizen and can be Sculari (warriors) or Rendari (scholars), Players may also choose to be Elves, Dwarves or Haflings. Each identity has an attribute bonus, specific weapon training, different starting gold, and a number of extra traits. These remain the same for all members of that identity. Each character also chooses four additional traits from a list of 69. These advantages range from Animal-Fried to Engineer, Lip Reading to Undertaker. Each character gains a number of languages depending on their Knowledge attribute. The setting puts an emphasis on literacy and the power of words. To help define a character's personality, players also select a major ambition. This offers a bonus in play when striving towards that goal. As well, in play minor ambitions may be added. Several other choices round out the creation process (equipment, magic and attachments) each dealt with in other chapters. Chapter Three covers Equipment- with players having to spend starting money in order to outfit themselves. The section's brief but comprehensive, with a general statement on the economics of the setting. Weapons and armor get the most extensive treatment, with many of them having special rules or exceptions. Chapter Four gets into the meat of the setting, laying out how this differs from a standard fantasy campaign. The group of player characters is collectively called a Novarium, which may have ambitions like a character. One problem here is that the game isn't clear about the process. It suggests that players will each have a Novaria, but will also play multiple characters. How many? Does each player make up two characters? Three? Is there a pool of these? It is left open-ended, but could use further discussion and explanation. On the one hand, for gamers who have played Ars Magica, the process will feel natural. But for new players or players unused to the concept, that needs further discussion. Given how Novarium opens by trying to make itself accessible and clear to those players, it needs follow through here. The Campaign chapter does do a nice job of offering options which will entertain players who enjoy a building game. Each Novarium starts with a March. Different Marches have different fonts of magic, players can recruit diverse retainers (though the list of types offers no discussion of role or effect), and unique landmarks may appear. A discussion of "seasonal" campaign lays out some basics, with the division and assignment of labor being important. Several kinds of specialized activities are offered (such as crafting and social influence). Chapter 5- Mechanics- talks about the application of the basic resolution system. Combat is a simple opposed roll, but damage is done using d6s. Each weapon does a certain number of dice damage. That is applied against a random attribute (1-4 Agility, 5-8 Fitness, 9 Magnetism, 10 Perception). Armor offers a die roll which is subtracted from the damage taken. The combat system has some detail and options; players can choose from a number of action/maneuvers on a turn. Moving and attacking, for example, adds one die to the attack difficulty. Defensive actions- Parry, Dodge or Block- take up a character's action. It is unclear what that means for multiple attackers against the same target. Based on the rules, I assume characters get only one defense as an action against one attack per turn. That has a significant impact on combat tactics. Finally as befits a game with OSR DNA, the game offers encumbrance and food rules, among other details on exploration. Next comes Chapter Six covering magic. The magic system for Novarium offers a imaginative and flexible approach. For any spell, players choose a method and a materia. Method defines the effect they intend (for example control, create, protect, strike, or transform) and materia defines what they're using or affecting (for example fire, life, light, or thought). The rules present 8 methods and 12 materia, each with their own distinct icon. Novaria have ratings in these areas- so for example a character with Control 7 and Earth 9 has a target number of 16 for spells of that type. The relative power of the spell determines how many d10 the caster rolls. Failure means a point of willpower damage. Additional options exist for pushing spell use. The magic system is the bedrock of this game- a really simple system with great depth and choice. Novarium lays out examples of casting with lovely graphics, making the system easy to grasp. Each method and materia is discussed, with excellent definitions of power, effect and difficulty. Anyone interested in magic for rpgs or how to lay out system information to make it accessible should read this chapter. The last two chapters of the book, about fourteen pages, describe the Novarium setting, the world of Vaena. While brief, the discussion of the history and especially the social structure are particularly evocative. There's a great deal of room for GMs to play with the elements given, but at the same time the world could be run from the text alone. The Gamemastering chapter provides ideas for designing the Mark, fonts of magic, and creatures. I'm honestly intrigued by the setting Novarium provides for several reasons. First, I like the focus on gender politics, which could be a great window into those issues (perhaps akin to the themes of Kagematsu). On the other hand, the GM will have to be fairly certain of their group before running. How will they respond to those questions? More generally, I like the idea of Ars Magica, but without the need to hide and stay underground. It takes some of the best and most interesting concepts from that rpg and makes them more accessible and playable. Historically-minded Ars players will cringe, but it makes it a solid fantasy game. Any quibbles I have are minor- a few places where rules need to be clarified or repeated for emphasis (mention armor in the damage section, clarifying character building, defenses, explain attachments). Honestly my initial thought after reading this is that I want to see more- a larger, expanded version of the rules. Novarium feels like it is straining against the bounds of the rules size. I have the sense that gaps and problems come more from the desire to keep the material tight and focused while still allowing players freedom. This is an amazing game; lovely, well-written and an example for anyone wanting to see how to put a game together. And it is free. If you have a system of choice, the basic setting and concepts of Novarium should be fairly easy to port over. The trick will be converting the magic while maintaining its freedom. In the other direction, Novarium offers more than a few mechanics which could be lifted elsewhere. For our most recent homebrew campaign, I borrowed and only slightly reworked the magic from this system. That's honestly been the most successful of several different approaches to magic which I've used. I will have to review this sometime in Jan or Feb of next year. I liked many twists (like the Vampiric Elves and the thick-blooded Dwarves - the Halflings are less convincing). The absence of a detailed political map of Vaena could be a problem. Greg Christopher seems to prefer systems to settings. There was also Andre Norton's Witch World, where only women could master magic. I'd forgotten about Witch World- my older sister was a big Norton reader, but for some reason I ended up skipping over her work entirely. I like any kind of setting that puts different or exclusive magics into the hands of smaller groups. I think Novarium, and Christopher's other excellent games, show more that he prefers concepts over full-fleshed settings. The system's important, especially in this game, but that's still serving the genre and idea he's playing with. I think by giving a more bare-bones approach, he makes the game more accessible. Those ideas, presented without a lot of lock down, give me plenty of room to play with. It does mean- as I think you're suggesting- that there's more GM work required to run a campaign in that specific world. But I'm more a fan of the loose approach- given my penchant for thieving ideas to hack together elsewhere.